This weekend, a dear friend and faithful blog brainstorm/critiquer asked me why I never write a critical review in my “Books of the Month” posts. However, since our discussion, the question would not leave me alone. I think she, and you deserve a better thought out answer. When I consider writing critical reviews, my first question is, who am I to set myself up as judge over the quality of an author’s work who has actually made it past all the gatekeepers and critical eyes on the road to publication? Surely, if a book has come far enough to be published by a third-party, there must be someone who will appreciate it. Although I will admit, it might be a limited number of individuals and not necessarily me. And if a book is self-published, as I novelist, I understand all the love and labor that went into producing it. Who am I that I should tear apart someone’s dream, someone whose hopes are not all that different from my own? Yes, of course some books are of higher quality than others. Some books can be quite flawed. But I do not want to be the person who points these things out. Then, after all my philosophizing, I had to laugh at myself. There is actually a much simpler reason you will not find negative reviews on Literate Lives. I do not finish reading books that I do not like and therefore cannot count them as books I read in any month. It took me many years of living with the inner insistence, “You must finish everything you start,” but finally, sensibly, I concluded that life is too short, time is too precious, and there are too many unread books on my shelves for me to finish any book I find to be low in quality or of minimal appeal to me. If I am not enjoying a book, fiction or nonfiction, that I am reading, if I do not feel it has anything to offer me, I may give it an additional chapter or two to improve, but if it fails to, I stop reading. You should too. So why read the “Books of the Month” posts? The “Books of the Month” posts are more a recommended reading list than a critique or review. They are an invitation to seek out a good read. In the end, all my initial philosophizing was not a waste. It clarified for me, again, what I want this blog to be. I want to bring light, joy, pleasure, and inspiration to others, and I want to encourage and support readers, writers, parents and teachers in cultivating a reading, writing, thinking, imaginative lives. Have you read any good books lately? Please use the comment section to respond. It’s been in “interesting” two months, and I can’t remember where the dividing line falls in the stack of books I’ve read since December. So, here it is: A January/February Reading Log. I loved Franklin’s mystery set in 12th century England, and the concluding books of Chima’s Heir Chronicles, were every bit as gripping as those I’d already read. Lastly, I found Wells’ book fascinating. Between my Greek ancestry and a novel idea I’ve got simmering on a back burner, I find this empire, that lasted more than 1,100 years, mesmerizing. This slim book expanded my knowledge about the western European renaissance, my childhood faith–Greek Orthodoxy, and the world from which generations of my Greek ancestors sprang. I look forward to learning more about it. Have you read any good books lately? Please share authors, titles, and genres so we can all add to our “Books I Want to Read” lists. I loved this book! I read it in one sitting, just gobbled it up. In Praying in Color, Macbeth discusses how she is often eager and willing to pray for others, but then finds that her prayer time turns into something more like a series of prayer snippets as her short attention span–and don’t we all have one of those nowadays!–keeps pulling her off topic. 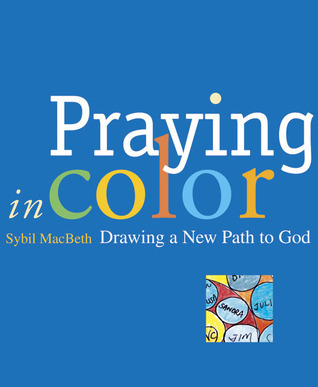 The outcome of her seeking a way to deal with this challenge is the book, Praying in Color. Basically, Macbeth advocates for doodling your prayers. She also emphasizes this has nothing to do with being a skilled artist. These doodled prayers are not intended to be works of art but rather an outpouring of our good wishes for the person or object of our prayer. Once complete, they also serve as visual reminders to continue praying in the days and weeks that follow. In Praying in Color, Macbeth suggests you allow yourself about a half an hour to sit down with paper, pens, and colored pencils or markers. Write the name of the person or object of your prayers and draw a shape around it. Then as you continue to pray, embellish the shape in whatever manner your thoughts lead you. By utilizing this process, she has found that what once were a minute or two or three brief moments of prayer have been transformed to 30 minutes of dedicated praying. Furthermore, she shares how this technique can also be used for meditating on scripture (another tough job for those of us blessed with butterfly brains), weighing and discerning complex issues in our lives, and memorization of texts (Something that, as a visual learner, I find challenging. I’m excited to try doodling something I want to memorize soon. In addition, as a Language Arts teacher, I can see great uses for this as another format for responding to reading. I prayed for a friend of mine who is battling cancer while I listened to this morning’s teaching in church. I just used a pen and an unlined 3/5 card. (I am going to add some color with my colored pencils–because I want to give her the card and the book–she is an artist). I found this did not distract me from the message, and yet, through my pen, I was able to weave a net of healing about her. Praying in Color is an awesome little book, and I highly recommend it. Think about what you have read. Check your comprehension level by imagining what you think will happen next? List three clues that support your hypothesis. Share your responses with your reading partners. Enjoy the first two-thirds of a picture book with your preschooler. Stop and ask him what he thinks will happen next. Listen to your preschooler’s response. Ask her what makes her think what she that this will happen? Read the rest of the book and discuss how it ends vs. what your preschooler had predicted. How would you feel if you were in the main character’s situation? or a dialogue between the main character and his or her best friend. Read and discuss your responses with your reading partners, or post your responses here on the blog. Remember to share the title and author of the book you are reading, so others can be inspired to give it a try. Enjoy a picture book with your preschooler. Stop at some point after the plot problem has developed and before it has been solved. Ask your preschooler what he or she might do in the main character’s situation. Discuss what might be the outcome of the story is its main character chooses this solution. When done discussing options, read the rest of the story. After its close, discuss how the author chose to resolve the story and how different or similar the author’s approach was from you and your child’s.